Everyone thinks they’re middle class. This isn’t a big surprise: the word “rich” has specific connotations (servants, mansions on the Gold Coast, 200-foot yachts, etc.) and even someone making $200-300 thousand a year probably doesn’t have any of that stuff. What’s more, most people in that income range were likely raised middle class, so culturally they still think of themselves that way even if their incomes give them a pretty comfortable lifestyle. Fascinating! 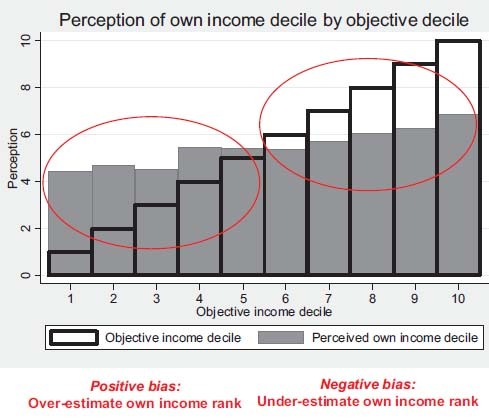 The very poorest thought they were actually in the fourth decile — just barely below average. The very richest thought they were in the sixth decile — just barely above average. If the same thing is true here — and I wouldn’t be surprised if it were — it could go a long way toward explaining the political dynamics of taxation and economic policy in the United States. After all, if the poor don’t really know they’re poor, they’re never going to mount much of a fight for more egalitarian public policies. And if the well-off don’t know they’re well off, they’re going to strongly resist more egalitarian public policies. The result can be startling increases in income inequality without anyone really knowing it’s happening or caring very much about it.